USSbriefs DISTRIBUTION: HOW CAN YOU HELP? A big challenge for USSbriefs is to ensure we reach a wide audience beyond Twitter. Please help us to achieve that by taking some of the steps outlined below. Check our @USSbriefs account on Twitter for templates of text you can use to share the briefs. It is important we spread this beyond Twitter, so please share it on Facebook, SoundCloud, Instagram and Snapchat. 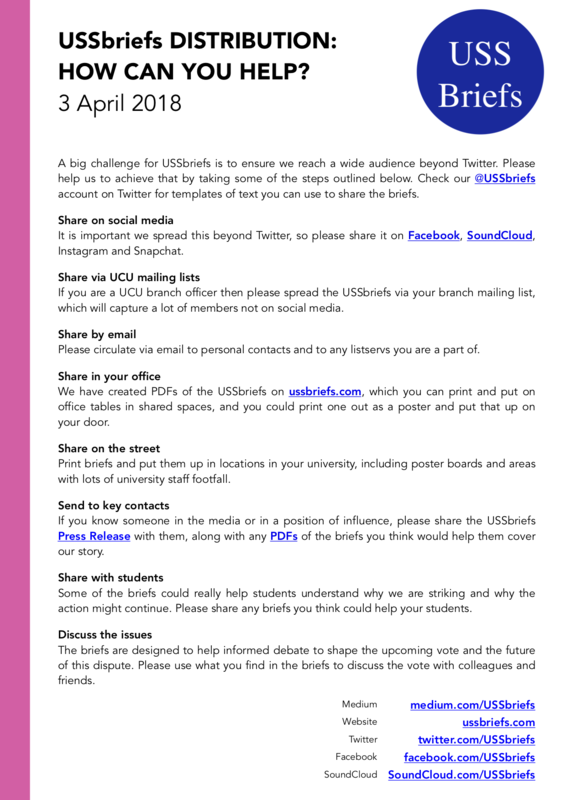 If you are a UCU branch officer then please spread the USSbriefs via your branch mailing list, which will capture a lot of members not on social media. Please circulate via email to personal contacts and to any listservs you are a part of. We have created PDFs of the USSbriefs on ussbriefs.com, which you can print and put on office tables in shared spaces, and you could print one out as a poster and put that up on your door. Print briefs and put them up in locations in your university, including poster boards and areas with lots of university staff footfall. If you know someone in the media or in a position of influence, please share the USSbriefs Press Release with them, along with any PDFs of the briefs you think would help them cover our story. Some of the briefs could really help students understand why we are striking and why the action might continue. Please share any briefs you think could help your students. The briefs are designed to help informed debate to shape the upcoming vote and the future of this dispute. Please use what you find in the briefs to discuss the vote with colleagues and friends. Download this Distribution Guide as a PDF, or as a PNG.